Looking to learn project management skills and don’t know where to start? Scotty’s got you covered. I can’t cover how to stop a warp core breach. Sadly, I don’t know how to reverse the polarity either. 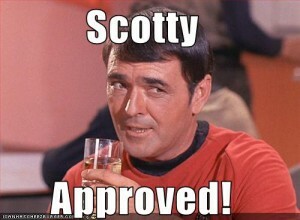 But I do know there’s much to learn about fundamental project management skills from Scotty. That may sound strange or even downright weird. For those readers who are confused, I’m referring to Montgomery Scott, the ingenious Chief Engineer of the Starship Enterprise. He’s quite possibly the most popular Scottish science fiction character of all time. He’s also pulled the Enterprise out of more scrapes and crises than I can count. Whether you’re a long time Star Trek fan like me or not, this guide will deliver the goods on project management skills. In Star Trek: The Next Generation episode “Relics,” Scotty makes an appearance after being stranded in a transporter for decades. Even though his technical knowledge is somewhat out of date, Scotty still knows the importance of managing expectations – especially the Captain’s expectations. Scotty is shocked when Geordi La Forge (chief engineer of Star Trek: The Next Generation) appears to have a very different understanding of expectations. Lt. Commander Geordi La Forge: Yeah, well, I told the Captain I’d have this analysis done in an hour. Building up your reputation as a miracle worker is one of the project management skills that hardly anyone talks about. It’s not something that one sees in PMP study guides (not that I’ve ever seen anyhow). 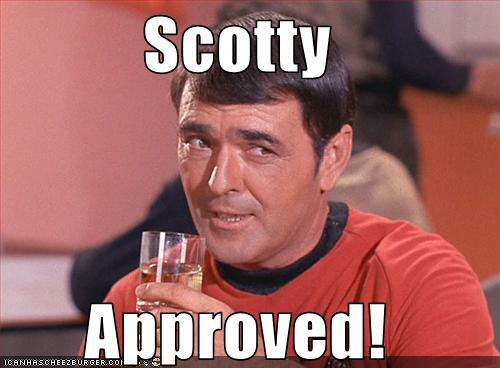 It is much easier to over deliver on your projects when you manage expectations like Scotty. It’s also important to observe that Scott still makes key contributions despite his dated technical skills. You don’t need to be the master of every technical skill in order to be a successful project manager. Project planning is an important tool in your toolkit of project management skills. In order for quality assurance to run their tests, you need to know when software development will complete a testable version of the application. In “Relics”, Scotty shares one of the best tips I’ve seen for project management planning. Scotty: A good engineer is always a wee bit conservative, at least on paper. In project management terms, what does being conservative mean? It means assuming that people will come and go on long term projects. With this awareness in mind, documenting project deliverables becomes even more important. Otherwise how will your project be delivered on time when your project team changes? As Scotty puts it, it pays to be a wee bit conservative in project planning. This concept also applies to planning a personal project. When you’re going on a trip, it is best to be conservative in packing a suitcase. After all, you’re the one who is going to be carrying the item on your travels. Of course, it’s also good sense to bring more money than you originally budgeted. In building your arsenal of project management skills, never forget the importance of creativity. Even in times of crisis (and blown deadlines), there are ways to rescue a project. Alas, in some cases the stress of a big project can kill your creativity. That’s why your project team needs a Mr Spock to calmly consider other options. In that case, the stranded crewmen face a vexing challenge. With very limited resources and none of the repair facilities available on a starship, they simply must find a way to launch the shuttle. In the end, the crew implements a solution that involves draining the power from their phaser weapons. In the project management world, your hands may be tied when it comes to budget. Don’t become overwhelmed – call on the logic of your inner Mr Spock to consider a wider range of alternatives. Looking for more interesting project assignments at your company? Whether you’re an employee or a project management consultant, writing about your expertise demonstrates your project management skills. If you’re like Engineer Scott, your writing will impact the world for decades. In “Relics,” Scott and La Forge are working together to restore a damaged spaceship to full operation. The ship has been out of commission for decades; the two engineers have few options available to them. Only creative thinking and the authority that comes from writing about your profession salvages the situation. Lt. Commander Geordi La Forge: Er, the tank can’t withstand that kind of pressure. Scotty: [laughs] Where’d you… where’d you get that idea? Lt. Commander Geordi La Forge: What do you mean, where did I get that idea? It’s in the impulse engine specifications. Scotty: Regulation 42/15 – Pressure Variances on the IRC Tank Storage? Scotty: Forget it. I wrote it. By showing that he wrote key engineering specifications, Scotty demonstrates his engineering authority. Once that point is revealed, La Forge rapidly becomes more willing to heed Scott’s suggestions. It’s the same reason that most patients tend to follow the directions of physicians: they have authority based on their professional expertise. In the 21st century, you have many options to write about your expertise. You can write articles for project management publications. You can start a blog to share your experiences. You can give a presentation at a conference and then write up your talk into an article. If you have a lot to say, you can write a Kindle book (with the right marketing choices, Kindle publishing can be lucrative too). What discussion of project management skills would be complete without a full discussion of communication? No worthwhile discussion in my book. In “That Which Survives,” Scott successfully completes a dangerous project and saves the day. By any reasonable measure, that is a major victory. In your own work, think back to the last time you completed a successful project. Did you act treat your project team like Mr Spock? Mr. Spock: Mr. Scott, you have accomplished your task. Lt. Cmdr. Montgomery Scott: You might at least say thank you. Lt. Cmdr. Montgomery Scott: [muttering] Never mind. Mr. Spock: …that requires an overwhelming display of emotion in a situation such as this? Two men pursue the only reasonable course of action, and yet you FEEL that something else is necessary. Taking the time and effort to say thank you to your project team is important. Struggling for ideas on how to show your appreciation? You can get some inspiration from Zen Habits: 10 Great Ways to Show You’re Grateful Today. If any member of your project team works at a remote location, I recommend writing a short handwritten thank you note and mailing it to them. Over the course of your career, you will work on a doomed project. It may not be fatally doomed, of course. At first, you may simply have a vague intuition about one or two vague deadlines being missed on the project. You might think that the project sponsor is handling the situation, so you don’t raise any objections. A few weeks later, you notice more missed deadlines, slipping morale, and worse. It is time for radical action to save the project. But what exactly can you do? One strategy is to stage a project mutiny with those in your project team. Keep reading to learn how Montgomery Scott considered a planning a mutiny on the Enterprise. Let’s see what Scotty would do in this situation? In “Turnabout Intruder,” Captain Kirk is acting very strangely. In fact, several of the senior officers suspect that the Captain to be unwell and unfit for command. Despite their misgivings, directly acting against the captain crosses a line. Ultimately, Scott proposes radical action. Scott: We’ll have to take over the ship. Dr. McCoy: We’re talking about mutiny, Scotty. In the corporate world, what does a project mutiny look like? It can take several forms. You can phone the project sponsor directly and express your concern about the project’s problems. You can also suggest removing a particularly troublesome person from the project. In the case significant unethical activities, you always have the option of resigning. These radical “mutiny” options are powerful weapons only to be used in the case of a major project calamity. Do you know how Scotty keeps pulling off success after success? It all comes down to a very simple tactic. When you read the tactic, you’ll probably nod and think to yourself, “Oh sure, I know about that.” It is a timeless principle of project management success (or professional success). Yet, very people put in the effort to implement Scotty’s tactic to establish and maintain his credibility. Read on to learn about Scotty’s proven tactic to sustain his credibility abroad the Enterprise. In the cult classic episode, “The Trouble with Tribbles,” Scotty engages in one of his favourite pursuits (and I don’t mean enjoying Scotch!). It’s a pursuit that Captain Kirk doesn’t share himself. Yet, this pursuit is responsible for much of Scott’s incredible success as an engineer. Let’s unpack that brief exchange between Kirk and Spock. What does Scott do for leisure? He reads technical articles to stay up to date on the latest technology. When was the last time you read a magazine about your profession? What about your industry? It is easy to tell yourself that you’re too busy. What if you learned one new idea that changed everything? That’s the power of following Scott’s time tested principle for staying at the top of his field. Where do you get started in staying current with the latest ideas? There are some excellent blogs at PMI – that’s where I came across lessons from World Cup coaches, even though I don’t usually follow sports. You can also subscribe to a major business publication like Inc Magazine. I also recommend reading classic project management books such as Making Things Happen: Mastering Project Management by Scott Berkun. I hope you enjoyed reading the Montgomery Scott Guide To Project Management. It was a treat to share these ideas with you. With the right attitude, you can find inspiration and ideas everywhere, even in fiction. It is simply a question of bringing your curiosity to the table. I recently watched the entirety of Star Trek: The Original Series on Netflix: these ideas gradually bubbled to the surface over a matter of weeks. It’s fascinating to me how you can take in ideas and stories for a long time and then suddenly, inspiration strikes! In the tradition of “The 4-Hork Workweek” by Tim Ferriss, I will end with a question and action for you to consider. Question: What is your favourite project management lesson from Montgomery Scott? Action: Find one idea from your favourite fiction – novel, short story, TV series, or movie – and implement it. Share your results and thoughts by commenting on this article. Great post! I have been managing projects with no training (the hard way) for years. I can’t wait to try out some of your suggestions. Curt, glad you found the article helpful. I recommend starting small – try one new idea at a time. Thanks for the post. It’s really hard to juggle different projects with competing priorities, but I really like how you pointed the technique of “Writing A Project Management Plan” to ensure things get done efficiently and effectively. I have a habit of jotting down things every 30 minutes so I can go back in time and review the task to determine if it does really matter anything at all. Writing down tasks is a basic building block to productivity. It is a point that bears repeating.